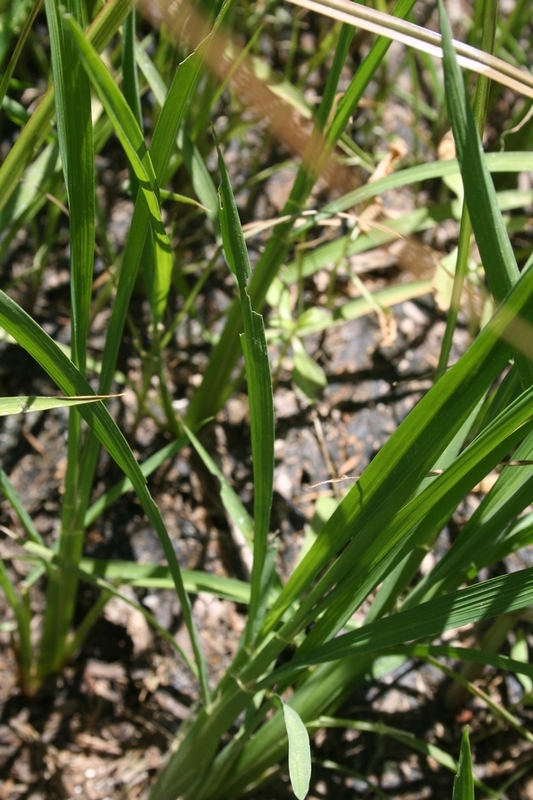 Earlier this week, I received reports of two fields near Willows that showed evidence of armyworm feeding and very small worms in the plants. Today, I sampled a field that had some severe armyworm affected areas last year. At first sight, there was no evidence of injury. However, when looking closely, some of the bottom leaves in the plants showed evidence of armyworm feeding. This is a 40-day old field, drained for propanil. When I shook the injured plants a bit, a small worm fell to the ground half the time. The worms were hard to notice; they were small, and their color ranged from yellow to dark green. Most of the injured plants and all the worms I found were in the corners of the field and next to levees, where the plants showed symptoms of N deficiency because the aqua rig couldn't reach. 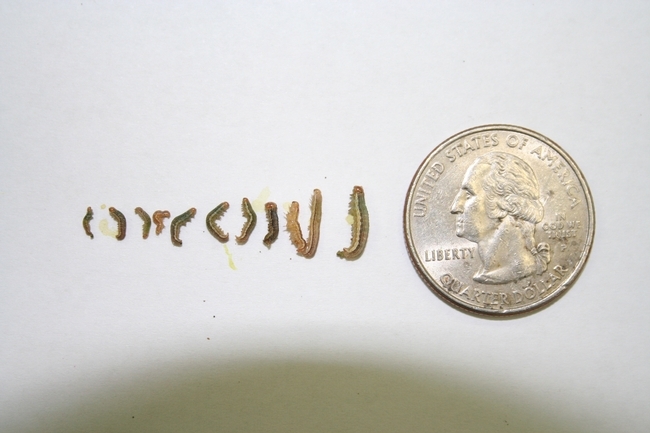 The larvae I found ranged from first to early third instar. It is the fifth and sixth instars that will cause yield reductions (look at the red line in the graph below). It should take between 127 and 268 degree days (above 50 and below 84.2 oF) for the larvae in the field I sampled to reach the fifth instar. Using average temperatures for the past 10 years, I calculated that we should be seeing fifth instar larvae between June 15 and June 21. Those dates are really close to the dates when we saw the armyworms causing problems last year. 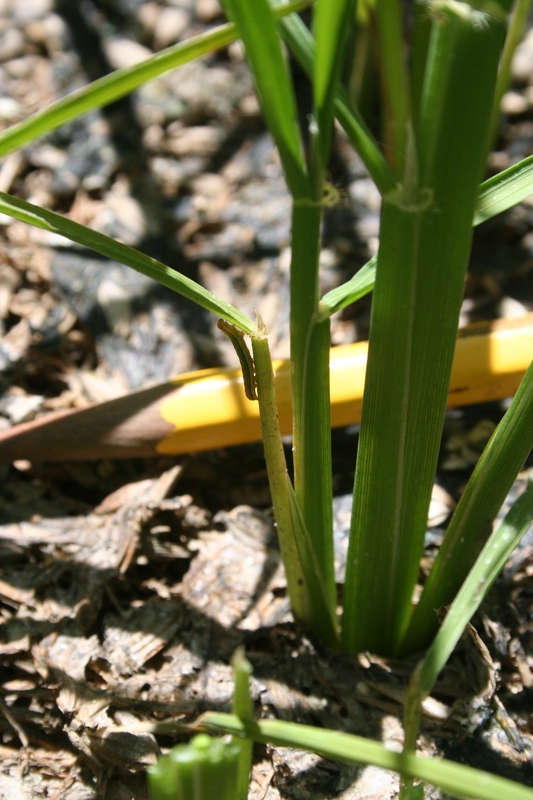 Start scouting for armyworms. Begin in the areas where plants are light green because of N deficiency (corners, levees). Small larvae do not cause yield reductions, but once they reach a large size, they can defoliate rice quickly. 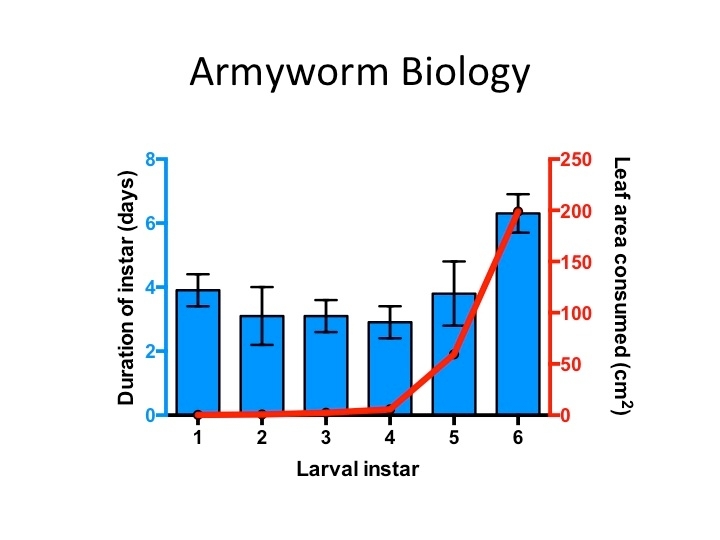 Additionally, the larger the worms are, the harder to kill with an insecticide. 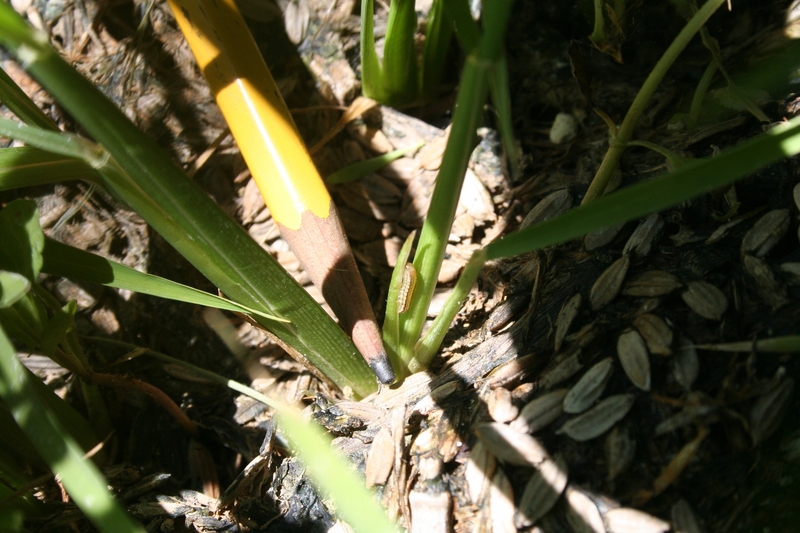 If you find small worms, it does not necessarily mean that they will reach economic levels. 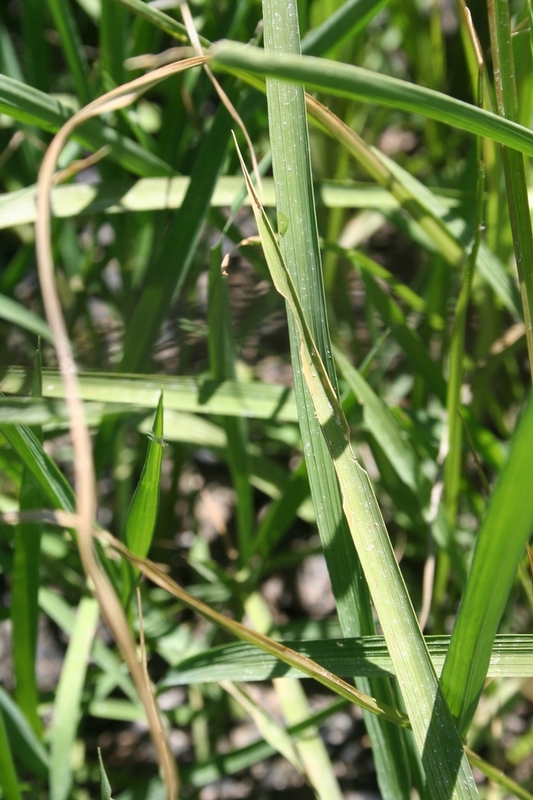 There are many natural enemies in rice that can reduce armyworm populations, such as spiders, wasps, and plant bugs. Weather can also affect the development of the worms. Monitor the field closely. Once defoliation is noticeable, plan a treatment soon while the worms are still small if you feel you are at risk of reaching the threshold. For information on thresholds, see the UC IPM website.